This heavy duty replacement for the factory bumper is available in full-width (58.5") and "shorty" (46") versions and features a lightbar/guard with two mounting tabs for offroad lights and shackle mounts. Warn winch mount sold separately. All parts are black powder coated. 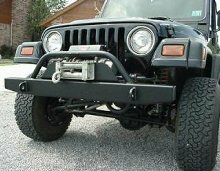 Bumpers are built to order and usually take 3-4 weeks for delivery.